Sometime in the late sixties, as Douglas Engelbart was preparing what would one day be called The Mother of All Demos, his boss flew to Washington to meet with the money man. The demo that birthed the modern computer mouse - and so much more - was funded by Bob Taylor, a NASA program manager who would one day take his own place among the titans of modern computing. Engelbart's boss had a single question on his mind as he walked into Taylor's office after a cross-country flight from Northern California's Stanford Research Institute. "He came from the west coast to see me, which was very unusual," remembers Taylor, also known for cooking up the ARPAnet and Xerox PARC's Computer Science Laboratory. "He came into my office and he said 'I want to talk to you about Doug - Why are you funding this guy?'" Needless to say, Douglas Engelbart's boss wasn't the only one who questioned the import of the mouse inventor's 1968 interactive-computing demo, which received a 40th anniversary celebration at Stanford University's Memorial Hall yesterday afternoon. Bill Paxton - one of the SRI researchers who participated in the demo - says that 90 per cent of the computer science community thought Engelbart was "a crackpot." "It's hard to believe now," he explains, "but at the time, even we [Engelbart's fellow researchers] had trouble understanding what he was doing. Think of everyone else out there." 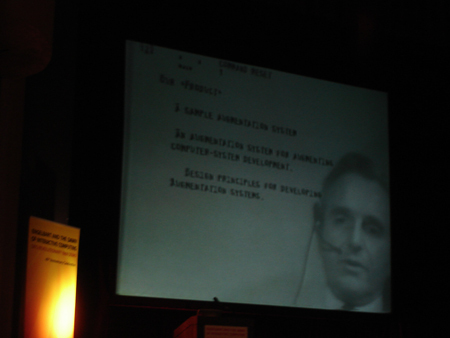 Three or four years later, Engelbart repeated his hypertext-meets-desktop-sharing-meets-video-conferencing demo. In the audience was an MIT prof described by Andries van Dam, another east-coast prof in attendance, as among "the best and the brightest" of the early 1970s computing cognoscenti. According to van Dam, at the end of the presentation, the MIT man raised his hand and said "I don't get it - everything you've shown me today I can do on my ASR-33." The ASR-33 was a standard-issue teletype - a machine that did nothing but print stuff you keyed into it. "In a Turing sense, he was right," van Dam says. "But that was completely not the point. The demo went right over his head, and I thought to myself, 'If the best and the brightest can't grok this, what hope have we got?'" As it turns out, there was hope. In the years to come, Engelbart's on-line system - known by the pseudo-acronym NLS - begat the GUI machines developed at Xerox PARC. PARC begat the Apple Macintosh. And the Macintosh begat a widely used operating system from a company called Microsoft. Engelbart didn't just invent the mouse. He and his team were the first to divide a graphical interface into windows-like subsections. "Even way back then, we already had the concept of multiple windows," Engelbart told The Reg in 2005. "Any one application could manage multiple windows, and you could easily move objects, paragraphs, and words between them." 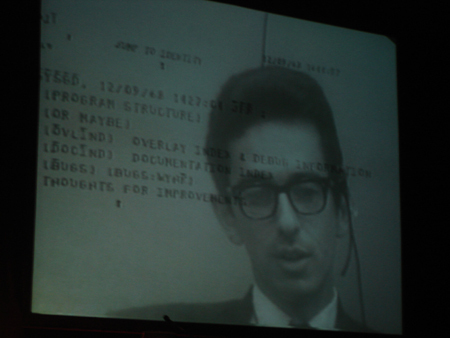 NLS also foreshadowed video conferencing and desktop sharing, as Engelbart demonstrated for Andy van Dam and about a 1,000 other computer obsessives on that December afternoon back in 1968. At yesterday's 40th-anniversary celebration, Engelbart's colleagues and peers gathered to hail him as one of computing history's great visionaries - a man who foretold the future. "[Engelbart] was one of the very few people very early on who were able to understand not only that computers could do a lot of things that were very familiar, but that there was something new about computers that allow us to think in a very different way - in a stronger way," says Alan Kay, the PARC researcher who built atop Engelbart's work with the development of the object-oriented computing environment he called SmallTalk. But those gathered for Engelbart's anniversary also warned that most of his vision was lost amidst the computer revolution.